WheelTurnerHawaii.com: The Festival of Sugar and Love weekend is COMPLETE! The Festival of Sugar and Love weekend is COMPLETE! The Festival of Sugar and Love weekend is wrapped up and is yet another SUCCESSFUL event weekend in the books. We started off the weekend with the 7th annual Festival of Sugar and Love slide jam up at the Loop. 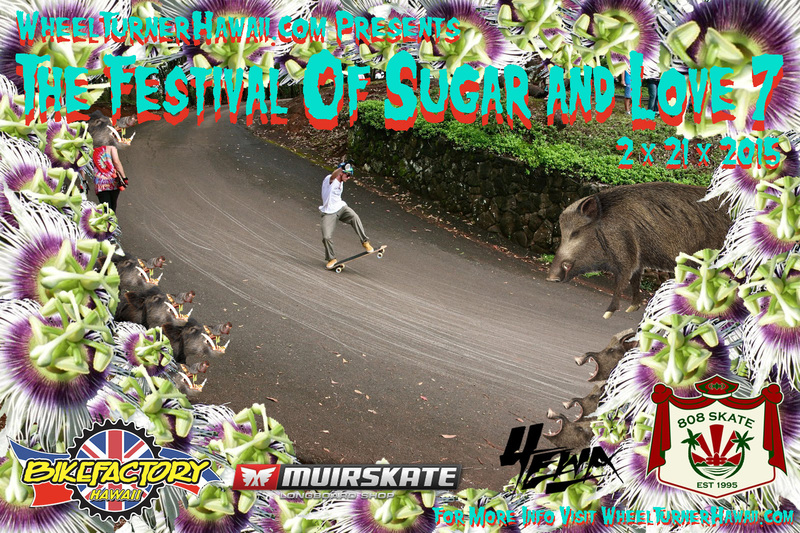 Like the past 6 years, minds were blown by the skill and style the Hawaiian riders gain every year! After a long day of sugar we kicked back for the F.O.S.A.L jam after party along with some prime camping right on the hill. The next morning we all woke up and led the parade of cars out to the North Shore for The Festival of Sugar and Love race! This is a F.O.S.A.L first time event and KJ Nakanelua did an awesome job on that portion of the event. We had beautiful weather and fast racing all day topped with nothing but good vibes! This is only the start of the F.O.S.A.L race, expect bigger and better things next year! We want to send a HUGE MAHALO to all of our supporters, the Rad Wheels team for making it out and all of you Hawaiians for killing it like always. The full write up, photos and videos will be up soon so be sure to check back!